Third decan Aries born between April 10 and April 20. If a person is born between these days, their ruling planet is Jupiter. They are Intuitive and generous, enjoy the company of others and revere learning and knowledge. They also enjoy the good things in life, and do well in the positions of trust and responsibility. They also tend to be adventurous, love to explore new things and love the company of other people. Initiators, they never shirk from helping out the others. These people posses a keen thirst for knowledge and they always learn new things with a surprising alacrity. The negative traits of them are that they tend to have unrealistic expectations and live in the dreamy worlds of their own. They love to explore and their adventurous nature makes travel a very important aspect of their life. Life as one big adventure for them and cannot resist trying out new experiences. They enjoy the company of others and they easily relate to many different types of personality. Because of this are often called upon to help solve others problems or give advice. Their generous spirit makes it difficult for them to turn anyone in need away. They have a thirst for knowledge they are very intelligent and like to use mind and intellect to learn. They often have some unusual ideas and concepts about life. They like the good things in life and will work hard to achieve the lifestyle that is most comfortable. The flaws in this third Decan Aries are that of being a dreamer and having unrealistic expectations. Passing now away from the development of the emotional body upon the astral plane, the mental plane comes next for the Ram and eventually, at the acme of the third stage the right use of the intellect is his outstanding achievement. At the first step of this period, the mind becomes the receiver of impressions from the outer world via the five senses and the brain. This is a negative condition whereby the modifications of the thinking principle are brought about through the impacts of the external world and the reactions of the Ram to the emotional plane. In the first stage of mental development the mind possesses only a vague diffused awareness, unidentified with any definite form of focus. The second aspect of the mental period of development commences when the Ram’s young mind is developed enough to begin to initiate its own activities, and when the intellect becomes the dominating factor and the individual becomes highly responsive to the thought currents of the mental plane. It is Jupiter which produces the ultimate expression of self-conscious personality existence. Under this expansive stimulation the Arietian mind begins to awaken and steadily becomes increasingly self-aware. The Ram brings the mind to bear upon information gained, sets his own individual stream of consciousness, formulates his own thoughtforms, as well as registering those of others. Superimposing itself on other people and things, the mind growing in its own power becomes the dominant factor overshadowing the entire personality expression. Ultimately, through this expansive unfolding process an intellectual grasp of environing conditions is fostered, a personal agenda formulated and definite plans made. In the interim period of mental evolution however, the semi-educated Arietian is blindly conservative, intolerant or bewildered by superior persons and does not endure or countenance any person who holds different values or beliefs. The recessive mind of the Ram is ready to strangle every new truth which happens to knock for admission. Also on the negative side, Jupiter fosters great mental pride and does lead to undue exaggeration and inflation of the personal ego which in turn leads to falsification, the tendency to stretch the truth and embroider the facts, and sometimes to pathological lying. This same stimulation inclines the Ram towards shallowness, fanaticism and callous indifference. Striking portraits of unevolved mental types are revealed in the unmitigatedly selfish activities of miserly husbands, bosses, deranged housewives, fraudulent schemers, dangerous demagogues and brutal bullies. Needless to say, their erroneous ideas, wrong thought, wrong actions and wrong speech have a devastating effect on friends, family and associates. An ability to see through, understand or overcome personal delusions is simply not yet actuated. At the preliminary phase of mental growth, the Aries man or woman is incapable of reasoning outside of the deprived uniqueness of their childhoods or traumatic personal life experiences. Remaining anomalistic, iconoclastic, ungenerous, and dishonest with themselves, they secretly and selfishly guard away their hidden treasures and wealth. They are able to excuse themselves and their actions by means of self-induced rationalization. 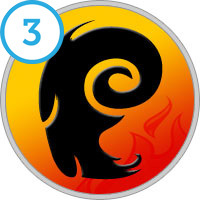 On the positive side, the Aries mental disposition is best described as engaging, outgoing, attractive, magnetic, good natured and freedom loving. The advanced mental type is well traveled, educated and exceptionally bright. This sign eventually produces eloquent, powerful and persuasive minds which are capable of exciting enthusiasm in others. In these cases the mental body becomes quite expansive and develops great imaginative range. It is in oratory and teaching that many Arietians find excellent scope for their exuberant mental energy. Their speaking and writing expression is Jupiterian in its free and flowing style, abounding in descriptive illustration and evocative phrases with rhythmic cadences. This is ideally suited to the entrepreneur, all manner of sales positions, marketing, public relations or inspirational speaking at pulpit, podium or platform in service of a chosen "crusade". With its rousing style of extempore address, measured swings and flights of eloquence, this speaker may be inspirational (even if grammar and style are defective and even if the ideas behind the words are illogical). Based on singular efforts and seemingly independent of anyone, the formation of real character begins to emerge, ejecting the Ram from the proverbial flock of sheep. Actually they eject themselves from the conventional social mold or fabric by "going it alone", and in so doing Aries people eventually become highly successful worldly icons convincing in their own right. This is accomplished through the ongoing process of constant battle, crisis, strain and struggle. Once Arietians have attained worldly success upon the Ordinary Wheel, they look down upon other people from their powerful positions. Outside of their immediate sympathies they will not lift a finger to help anybody or anything. The Aries mind loves to exercise military type authority, control and power over lesser minds. Within the limited scope of personal power and the range of personal desire therefore, the power to influence, sway, guide and hold others is gained. They love to be admired or adored. They love nothing more than to exercise their persuasive minds when people seek their advice. They are good at giving someone else a piece of their own mind, so to speak, but give little else. They express at times, a truly elitist contempt for others and belittle those less successful and fortunate. A real handsome, strong, rugged, superior individualism emerges here along with a rough but perhaps dangerously disengaging maverick quality. A magnetic, charming character bent on going its own way and doing its own thing comes to the forefront. Some women cannot help but be attracted to—and are often abused by—this type of man. The male of the sign will relish having a cause to fight for and delight in being a woman’s champion, defending and protecting her with his full strength, wealth, honor, personal code of honor and power. In this way he proves his virility, masculinity and machismo. The female Arietian on the other hand, will fight to insulate, protect, heal, nurture, shield and guard her man, thus proving the potency of her femininity. In both sexes, individual life-purpose is still totally centered in the realm of personal selfish desire, with the formulated intention of its own satisfaction and assuagement. Jupiter’s influence also fosters the development of the "wish-life" with its objective of dream fulfilment. These dreams are concerned with personal happiness, passions, comfort and wealth leading eventually to nothing less than the attainment of consummated desire of all and everything on the physical plane. Thus do dominant Aries personalities come into being and find themselves; they discover the distinction between their true self and the personality equipment employed; they finally become conscious of vocation in the true sense of the term. Paralleling this sequential development is the slow inner growth of soul awareness. At the advanced mental stage the law of actions and their consequences, the inevitable harvest of the fruits of our deeds, is now beginning to be understood. Once the Ram has a well-founded belief in these principles he or she automatically avoids doing wrong and becomes properly oriented, guided and motivated. Although Jupiter does ultimately guarantee the satisfaction of selfish personality desire and material ambition, philanthropy will begin to occupy the foremost place in the mind where previously only professional zeal and a keen appreciation of personal glory had reigned supreme. In the final analysis, Jupiter spells release from negativity and blind unintelligent acceptance. Especially in situations where civil or religious freedom is being curtailed, the insightful mind of the Ram will be found actively engaged. What is demanded of the Aries man or woman at the advanced mental stage of personality development is not acquiescence and acceptance, but rather correct activity and free choice based on the separation of the good and high values and truths from the low and undesirable. At their best, advanced Arietian personalities are highly educated, widely-traveled, multi-lingual, international, cosmopolitan, refined, enthusiastic, interesting, versatile, diplomatic, caring, positive, open, affectionate, independent, intuitive, responsible, innovative, skillful, technically competent, proficient, organized, generous, honorable, fair, controlled, inspirational, expressive, socially adept, pragmatic, goal-oriented, sincere, good-natured, lively, successful, magnetic, colorful, visionary and imaginative. An integrated Ram personality demonstrates a lucidity of clear perception and an inclusiveness which aspires to a comprehensive point of view. A real tact has been evolved along with wonderful manners, good taste, etiquette, tolerance, patience, serenity, empathy, sympathy and compassion. The power to teach and illumine is gained along with an ever expanding and unfolding love of knowledge, wisdom and truth. This increases receptivity and impressionability, thus cultivating an exquisitely developing artistic sensitiveness. The Aries male emerges as a gentleman; perhaps a veritable diamond in the rough, but a real gentleman nonetheless. The refined Aries makes a truly wonderful and accomplished host or hostess loving to entertain, party, dine or feast at home. In this way, if you can tolerate their personal manner and charisma, they are truly generous and magnanimous to friends and family. The finer things in life—such as art, wine, food or beautiful women—are appreciated, sought after, enjoyed and collected. This serves to reinforce the ego’s sense of itself and its own self-conscious importance, identity and tastes. Jupiterian mental enhancement of the thinking process produces an efficient, precise mind capable of organization and understanding. Eventually this mind blossoms into a realm of fruitful and useful stimulating activity in the world. As we can see then, the Ram emerges from the fold eventually arriving at an intelligent understanding and a life directed by purpose, forethought and planning instead of blind, unintelligent acquisitive grasping. The cycle of feeding ardent desire, engaging in constant worldly undertakings and securing material advantages begins to wane and comes to a close. The blind process of evolutionary acquiescence becomes an increasingly conscious effort. It is Jupiter that reveals to us the method whereby the instinctual nature is transmuted and sublimated into real intellect. Why is this so? Because the intellect unfolds here as the result of applied life-stimulation, the basic expansive evolutionary urge, the normal processes of living and wide experience through diversified contact with the environment. Rapid growth away from the teaching and training of childhood is typical of the mentally advanced Arietian. Rapid assimilation of fresh ideas, always being at the forefront of progress in their field of work, and active sympathy towards new thought, are the benchmark traits of the mentally polarized and integrated Ram personality. As writers they are capable of rising above the mundane and approaching universal themes. After a vast cycle of lifetimes of garnered experience upon the Wheel, when the Ram finally succeeds in climbing the mountain of vision the perspective changes and the horizon enlarges. As the three-fold personality has now been integrated into one coherent functioning unit, the Ram can now direct, co-ordinate and control personal thought, feelings and actions. The concrete mind is fully unfolded and reaches its apotheosis during the high water mark of the third period, signaling the advent of the dawning of the spiritual intuition and the nascent awakening of the synthetic powers of the higher or abstract mind. The Ram must now prepare to end the cycle of the closed self-centered life and open the door wide to spiritual energy. The Arietian moves forward along the Path of Life now by subjecting him or herself to the purifying process of what is termed the "burning ground" of the soul. This is the beginning of the period wherein the Ram changes life direction, purpose and method of working. When the fires of the personal or lower concrete mind are sufficiently intense, the metaphorical "jungles of experience" begin to be "set on fire" to eventually on the Reverse Wheel, disappear in the "Egoic flames" of the soul. With rapidity the dense fogs of personality illusion begin to dissipate, allowing ever increasing soul light to pour through. Only at this point does the future Way stand clear and unobstructed vision is attained. Through this process the Ram becomes aware that there is a divine Plan which underlies all fiery experiences and that these fires are in fact literally the living, moving, breathing, active, creative and formative agent. Attainment of this realization is the entry point or portal for the fortunate Ram seeking the path of true happiness, profound meaning, unfettered enlightenment and transcendence. With down-turned horns it is now time to knock with true headstrong power for admission at the door of Initiation and request entry. New challenges now await, fresh battles and glorious new spiritual warfare eventuates as the Ram prepares to conquer the heavenly citadel of the Self and "take heaven by storm".